MELBOURNE, TUESDAY 28 APRIL 2015: Today, the Australian Mathematical Sciences Institute (AMSI) and the BHP Billiton Foundation launch Choose Maths, a five-year national program that will turn around public perception of mathematics and statistics as a career choice for girls and young women. Working from the ground up, Choose Maths begins with a focus on mathematics education in primary and secondary schools. The BHP Billiton Foundation has contributed $22 million toward the partnership, which will enable AMSI Schools to expand its outreach capacity across Australia over the next five years. — holding annual BHP Billiton awards for excellence in the teaching and learning of mathematics. Research-based strategies for encouraging girls and young women into mathematics and STEM-related courses will be core to the program. The large-scale careers awareness campaign will be driven by research into community perceptions about mathematics. Innovation-active businesses are around twice as likely to use engineering and science skills, and three times more likely to use information and communications technology skills than innovation-inactive businesses . It is estimated that 75 per cent of the fastest growing occupations require competency in the STEM disciplines . It is no surprise, therefore, that in a 2013 survey, conducted by the Australian Industry Group, the majority of businesses indicated they had difficulty recruiting employees with these skills . If no action is taken, demand for tertiary graduates with STEM skills, particularly mathematics, will continue to outstrip supply. 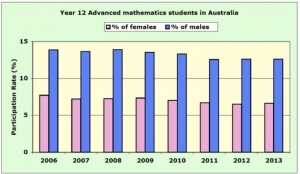 The percentage of male mathematical sciences graduates in Australia sits at half the OECD average; for women this drops to one-third . Between now and 2020 we need new PhD graduates to grow the expert mathematical and statistical workforce by 17 per cent – a currently unattainable figure . If Australia increases the participation of girls and young women in STEM we can contribute to addressing the gender wage gap and fill graduate places needed to secure a productive and innovative future. Eliminating the gender wage gap could be worth around $93 billion – that’s 8.5 per cent of GDP . “The low participation of girls and women in the study of the mathematical sciences and in the quantitative professions is a significant national social and economic challenge. “This landmark five year project, undertaken by the Australian Mathematical Sciences Institute and funded by the BHP Billiton Foundation, aims to build self-sustaining education communities where girls and young women share equally in the rewarding careers and rich life experiences that mathematics offers,” says AMSI Director, Professor Geoff Prince. — In 2010 the Australian Industry Group said more than 75 per cent of employers responding to a survey reported that low levels of literacy and numeracy affected their businesses. — Forty per cent of Year 7-10 maths classes nationally are taught by teachers who are teaching “out-of-field”. These teachers are qualified teachers, but their undergraduate course was not in mathematics or did not contain sufficient mathematics for them to undertake a method subject in their diploma of education. This figure is roughly three times the international average and twice the estimated rate for Year 7-10 science classes. — 54 per cent of adult Australians have only basic numeracy skills. — Research found that almost three quarters (74 per cent) of students who studied two science subjects in their final year of secondary school continued to study science-related areas at university. 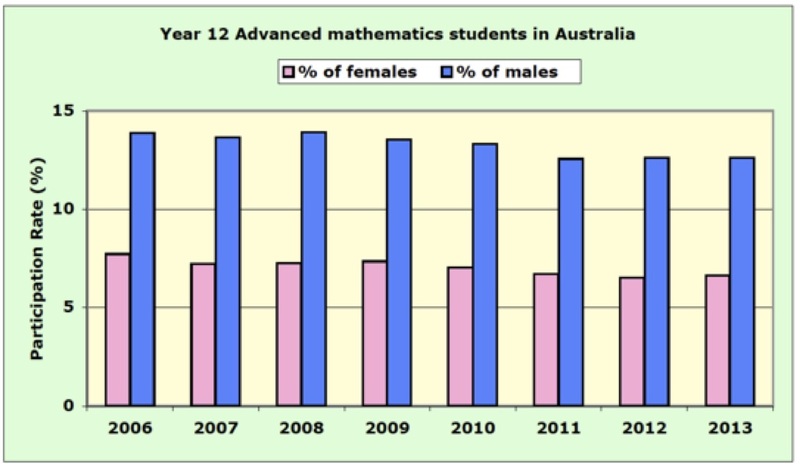 — The figure below shows the number of girls and boys participating in advanced mathematics subjects at Year 12 between 2006 and 2013. Becker K & Park K (2011) Effects of integrative approaches among science, technology, engineering and mathematics (STEM) subjects on students’ learning. A preliminary meta-analysis. Journal of STEM Education, 12(5/6), p23. Australian Industry Group, Lifting our Science, technology, Engineering and Maths Skills, Australian Industry Group, Sydney p.p.3-7. Edwards, D., Radloff, A., and Coates, H. (2009). Supply, Demand and Characteristics of the Higher Degree by Research Population in Australia. Canberra: Department of Innovation, Industry, Science and Research, Commonwealth of Australia.